The chairs are great. They were a gift for my husband. He had looked at the "Gator" collegiate chair but wasn't sure of the blue color. I bought the green and had his logo embroidered on the back. They turned out great. They are sturdy and comfortable. This chair is exactly what I wanted. It is sturdy enough for a big man, folds easy and is light weight and easy to carry. I would highly recommend it for everyone. It is great. It is really sturdy and comfortable. Looks like it will last for many years. Has lots of pockets for storaging stuff that you need while sit around the camp fire. Love it, probably going to order a couple more. We love the chairs and they are so light and easy to carry. It was the right price too. It is so nice to have a table attached also. We have some similar chairs without the pocket and table, and found the design much better than the heavy steel fold up chairs that you have to struggle with to get back in the bag and are clumsy to carry. I was delighted to find these chairs with the additional features. The aluminum frame is sturdy and light, and 4 of them folded flat take up less room than the other kind. Also they do not sink into soft ground and sand, nor does the front edge of the seat cut into your legs like other chairs do. The last 2 green chairs ordered were numbers 7 and 8. A year ago I bought 2 red, 2 blue & 2 purple, as Christmas gifts for family & we all love them! I removed each saddlebag from chairs & had each person's firt name sewn on. That was a big hit! They are comfortable, convenient & many people have asked where I bought them. 5 stars! The last 2 green chairs ordered were numbers 7 and 8. A year ago I bought 2 red, 2 blue & 2 purple, as Christmas gifts for family & we all love them! I removed each saddlebag from chairs & had each person's firt name sewn on. That was a big hit! They are comfortable, convenient & many people have asked where I bought them. The chair is light weight but very strong and sturdy. The fold out table on the side is very handy to put food or drinks on. I take it to car shows and other events where seating is limited. Very easy to fold out or fold up and easy to carry. Good heavy duty, and sturdy chair. After I got mine, several of my friends decided to get some. I am very pleased with this product! It is just what I expected, light weight, sturdy, spacious, and easy to carry. This chair will get a lot of use during this summer and future summers. It is very practical to have a chair with a tray attached to it. Thank you for making such a fun and practical product! This is beautiful craftsmanship and a sturdy build. My wife attends many dog shows each year and she needed a chair that would stand up to continuous use and be user friendly. This chair fills the bill. The final touch was I t took the chair to an embroidery shop and had them put her Kennel name in white on the green back. All I can say is...WOW !!!!! It was quick delivery and in new condition. It is a nice chair! It is very well designed, comfortable, convenient and a first class product! There are only 2 minor drawbacks. 1-the plastic snap clip on the carrying strap should be metal so it doesn't break if you step on it. 2-be careful not to skin you knuckles in collapsing it. My husband and I love this chair! It is light weight and easy to handle. The Chair is exactly what I expected - sturdy and comfortable! The chairs are very comfortable, light/easy to carry, attractive and have received good reviews from my visitors who have used them. I sat in one some time back at a neighbor's campsite. I was so impressed with the way the back is situated and keeps you erect. Other similar chairs tend to lay you back to an uncomfortable angle. This was important enough that I sought out this product to purchase. I will be purchasing some more soon. This order was a gift. I had already purchased two previously and wrote a review at that time. I'll say again; they are well constructed and a great value! The chair is comfortable, easy to carry in the field and with enough storage pockets to keep essentials at hand. Since I have only had it for a short while, I cannot comment on its durability. I LOVE these chairs. It is great for me to do embroidery on, as the back has on easy off and on assembly. I have love my chair. A friend of mine has one and I loved hers so much that I ordered one. I have bought many lawn chairs over the years but was never really satisfied until I saw this chair at a wedding. It is the best chair I have ever purchased. It is light but built very strong. It is very comfortable and great just to relax in. No more carrying a table with me to sit my coffee on because it is right there on the chair along with places for my phone and every thing else I need. This chair will stand out in any crowd. I don't know what I'd ever do with out it! These Camp Chairs are quite good in design and strength, with quality, and made of durable materials. I find them to be light, but strong. The seat and back material is first rate, and very finely made. My friend recommended these, and they are the best folding camp chairs. The chair is great, is easy to handle and store. We love the chairs and everyone asks where we got them! Others have similar chairs with steel frames. We like the lighter aluminum framed ones better. They are easy to carry around with the carry straps when going to concerts in the park etc. I was very pleased with my purchase. The green was out of stock but blue works just as well! 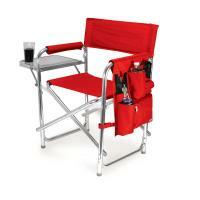 We have not yet used it but we did try it out and think it will be a great chair for camping and watching ballgames. The picnic chair is the most comfortable lawn chair I have ever sat in, and I love the attached side table. This is well made, comfortable to sit in, lightweight and easy to carry! We found the chairs quite comfortable to sit in and the side table is a nice plus! Great product! Lightweight yet sturdy. Easy to use and store. Highly recommend it. We're ordering two more for our daughter and son-in-law. Good addition to our camping equipment. 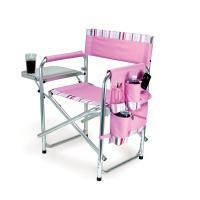 I absolutely love the Picnic Time Camping chair. Purple is my favorite color and I was surprised to find a chair that was handsome, comfortable and affordable. Thanks for a wonderful addition to my traveling equipment. Wickedly awesome chair! I use it at dog shows and can't live without it. The chair is very comfortable, plus sits high enough & firm enough for easy getting in and out. This is one of the best chairs I have ever purchased. I have owned another of this type by a different manufacturer and it just does not compare. Very good quality, love the shoulder strap and the pockets are the perfect size. Highly recommend this chair! I love the chair! It is light weight, functional, and comfortable. This chair was a gift to be used by our son at agility trials and obedience trials. He was very pleased with it. My wife and I absolutely love the two chairs we bought. I was surprised that the chairs looked exactly like their picture and, seem to be much sturdier than I had anticipated. Spring is in the air and we are both looking forward to regularly using them at the beach,for picnics and at outdoor concerts. This is a solid seat, while light enough to carry around. The pockets and flat surface that folds out is perfect for assisting a guy multi-tasking during those long drawn out sporting events. I sell products to the horse show industry. These chairs are a huge hit because they are durable, attractive and very useful. The chairs with the side table are really great because of the hanging bag on the side for personal items. This chair is strong, comfortable, handy, and practical. This is the perfect side table for lunch time and side pockets to hold paper work etc. The chairs are well constructed and durable comfortable to sit in. I would recommend the chairs for buyers. The folding side table is great for setting drinks,magazines, etc.. It is a very nice chair. This is a cool chair. It is nice and sturdy. Rating is "out of the box." It is well made! We first saw these chairs at an outdoor gathering and had to have them. They are just great. They are light weight and perfect for those, like myself, who bring the whole house with them. I am very happy with this product. The table and pockets come in very handy. We liked it so much we bought several. It looks great and is easy to carry. With the included shoulder strap, it is lightweight too! These chairs are the most comfortable "take a longs" that we have found in a long time. They support "wide bodies" and have all the pockets and table space you need to have everything handy for hanging out at the campsite enjoying the view or a good campfire. I absolutely love the chair. We took it camping in Moab for New Years and it worked fabulously. The side table was great for holding the dinner plate while we tended the fire or our puppies. After purchasing this chair, last year for a Christmas gift, we got another this year for another family member. Our son plays college baseball and the double headers are several hours long. This chair is comfortable for the entire day. The wide seat accommodates those of us whom are "well-reared". The chair is very sturdy and easy to get in and out of. The table is very convenient to use. I love this chair!! It is easy to get in and out of because it sits high and the seat does not sag. The chair is also a bit wider than others and that is wonderful for larger people. I love the side table.Now I have to get a purple one for Mardi Gras!! They all loved them! I had purchased four in all. I bought the chair as a Christmas gift. The recipient loved it and it is perfect to take to dog shows. The fold down table was a real hit. It is a very comfortable chair with great back support! It was everything I wanted. The quality was great and I am very satisfied. These chairs are exactly as described. They fold/unfold easily and are lightweight to carry. No more hassling with a tangled up chair bag! The chairs are also easy to get in and out of and have good back support. The only disadvantage is that they take up quite a bit of room to store. I look forward to using these at my daughter's all weekend softball tournaments. They look very sturdy! This is excellent quality & comfortable beyond words! These chairs are very easy to store and with the dual carrying straps and lightness,they are easy to carry anywhere. If you are a camper, there is no better chair out there. These were gifts for our children. We had purchased ours at a R.V. rally and really liked them so we knew they were great! The folding chairs were exactly what my fiance was needing for his racing trips. They arrived quickly in very good packaging. The chairs are well constructed and sturdy enough to support big guys wearing heavy leathers and their gear. I really did not have a chance to use all of the chairs, but a friend of ours has them and are very happy with them. I liked the looks and the side table and container bag on the side. They are very comfortable to sit on. Would you consider in the future to have a foot or leg rest that could be attached? Undoubtedly, the most comfortable outdoor chair I have ever sat in. It is also very light and therefore easy to transport. 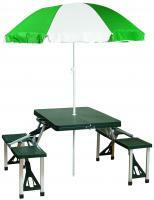 With the swing up table and storage, it is perfect for outdoor events. We have used your chairs for several years, as we are dog show people. This chair was purchased as a gift for a friend. The chair is very lite and works very well for a long day ringside. The chairs were exactly what was advertised. The quality is superior. The delivery was exactly on time and we are pleasantly surprised.We have some friends in the same club that bought some. I have not used the chair much, but intend to do so in February when I go to Florida. The one time I did use it, I found it to be well built and roomy. Also the addition of the small table and storage pouch is wonderful. This is a Christmas gift for my son and his wife. They saw these chairs at one of their son's baseball games and wanted one. They are a great chair and the kids will really be excited to get them. Thank you! I am very satisfied with this chair. This chair is great! We spend a lot of time on the soccer fields. I love it because it is comfortable, the table comes in handy and it is light to carry. This is a great chair for our camping needs! The side table and pockets are perfect. Sitting around the campfire will be a pleasure. Both my wife and I love the two chairs our grandkids play sports and we use the chairs almost every week end. Probably the most useful camping chair I've ever owned because of it's side accessory bag and the wide selection of colors available. It's sturdy and the side accessory bag keeps water bottles, 2-way radios, cell phones and other items out of the dirt. I have used similar chairs in the past that have the side table, but things get knocked off the table or fall off--having the security of the pockets is THE selling point of this chair. My husband is the envy of all the other soccer dads at my son's games! I bought these chairs to take to outdoor sporting events. 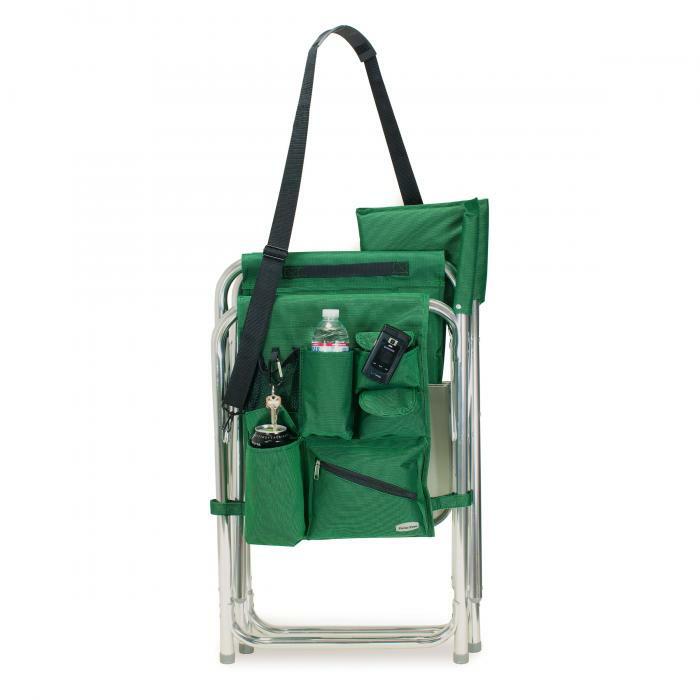 They are comfortable and convenient with the side table, pockets and carrying straps. I bought this chair as a present for a family member. They loved it! They liked the comfort of the chair and the pop-up table. We were impressed with the quality of the chairs and the quick delivery time. We have not used our chairs yet but we are well pleased with the quality. We had seen other RV people using these chairs and were impressed. I bought these chairs for my parents, who have difficulty getting up and down. They absolutely love them! They're comfortable, provide great back support, easy to fold and carry, and the pocket and table features are fantastic. I bought these chairs for the dog shows as chairs are not provided for participants or observers. I had my daughter embroidery our kennel name on the backs. I love them and would highly recommend them to other dog show participants. The chair is comfortable and convenient. You can eat without spilling everything. The pockets are great for storing things. These chairs are wonderful. We now own 2 of them. They are extremely comfortable for heavy or thin people. The storage pockets and little table for food and drink are an added bonus. A number of people who have seen us using them have asked what brand they are and where they can get them. We were very pleased by the overall look and performance of the picnic chairs upon their arrival. We operate a horse training business which involves a lot of traveling and setting up a sitting area at the shows for our clients.They were all impressed with how comfortable the chairs were. We checked out similar products from other sources, and found them to be not nearly as well constructed. These should last a long time. This chair takes tailgating to new heights. It is very sturdy. We are planning on buying some for Xmas presents. Your Picnic Time Sports Chair accommodates my rather large frame. I am 6'5" and near 300 pounds! The quality of construction and comfort is tops. I receive favorable comments (on the chair) everywhere I take it. This is a great and comfortable chair! I have friends who have this product also. All of us feel that it is an excellent purchase. We all use them when we are camping in our RV. This is the best patio chair we have ever had. It is very comfortable with a cool retro style. We are completely satisfied with the support provided from purchase to delivery. I purchased the chairs for UFL football tailgating. Everyone asked about them. They are great! One of the tailgaters purchased three chairs and another has sent for two. I keep the purchase info with me because the chairs draw a crowed. I hope you keep plenty of red ones in stock. U of L fans are tailgate copy cats. High-quality manufacture, comfortable to sit in, and lightweight for it's features. The table and side pockets are God sends if you are actually sitting in the middle of a field trying to eat lunch while watching an event with binoculars. I have a half-dozen other types of folding chairs, and this one is the best balance of portability versus usefulness. It is ideal for a drive to events like racing, picnics, and etc. I feel it's worth the price. This is a high-quality manufacture, comfortable to sit in, and lightweight for it's features. This is an excellent chair! I purchased 2 of these. I took them to a family gathering recently and everyone loved them! My husband and I never got to sit in our own chairs - the other family members wouldn't give them up! These chairs are VERY comfortable and lightweight. The folding side table is extremely convenient. I bought 2 of these chairs as a "Best in Show" trophy for our dog show. It is very popular with dog people! This chair meets all my needs. We frequently go to cookouts and concerts at a friend's farm and these chairs are ten times more comfortable than the old sling chairs we were using. The side-table and pockets make keeping track of all of our belongings a breeze. The 3 chairs that we ordered came earlier than we expected and have been a BIG HIT from day one! There hasn't been an event that we attend that someone doesn't come over and say "Where did you get these?!" Because we go to many outdoor concerts and events, we needed to find chairs that are easy to carry and sturdy (we are all much taller and "fluffier" than most people). These chairs are comfortable and beautifully designed-we love the side tables and use the side pockets to hold "essentials". People really notice that we are able to comfortably sit for long periods, but then we aren't "stiff" because we've been slumped and in bad posture in those bag chairs. We will be ordering more!!!! I love my chairs. This is the second generation of them I have bought and had the backs embroidered. They look wonderful! It's real simple--this is a folding, portable chair that's as easy to use as a bag chair, but the seat stays flat, making it MUCH easier to get out of. Some bag chairs put you in a tough position to exit. The kittle table works great too. 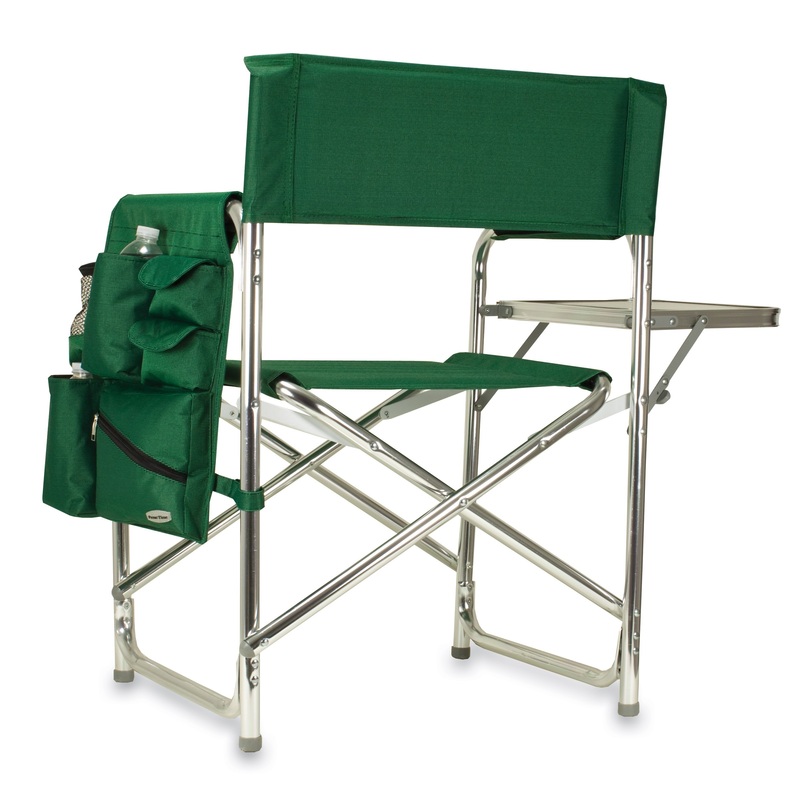 The sports chair is a great item, it's big enough and light weight and best of all, sturdy! I am satisfied with the quality and workmanship. It is a great product and works very well for the handicapped! From a baseball mom whose had every chair known to man in the last 15 years, this chair is awesome! Lightweight, folds flat and best of all, NO BAG to cram it in for carrying! Just a shoulder strap. I love having the table and all the pockets to keep things off the ground. My husband has always had a hard time getting in and out of folding chairs, as he is a big man. They are the BEST holding chairs we have ever had. Have taken them everywhere we go, to car shows,music events,picnics and I will be getting more of these for our deck. Very well made and the pouch and side table are so handy. Thanks for a superior product! I found the chair to be roomy and the table usable. The side pockets are a bonus feature that have made me the envy of my fellow campers! This is the best sports chair I have ever bought! All the baseball moms want them! It is very comfortable, the pockets are great for bug spray, keys, cell phone, a score card and pencil. The table is just perfect for our game time snacks! The only problem I have is when I get up someone always tries to sit in it! A wonderful and useful purchase! I have only used my chair a few times but it works well for dog and picnic events. I love having the hanging flap on the side to put things in. The table is also handy when eating. I love them. I've given your website to several people who want them too. We purchased two of the chairs and was so impressed with the quality and timely delivery we ordered two more for anniversary gifts for our travel/vacation friends. We only wish there was more of a color selection, in our case we would have preferred the last two in Camo and Pink. We realize the pink is a bit unusual but we can see the Camo being very popular. My husband and I have been campers all our lives and these are the best chairs we have ever had. They are sturdy and functional, as well as being light weight. We love having the attached table and the bags for incidentals. A super product! I love the chairs. The only improvement we would make is to have a footstool available to go with it. Excellent product and everyone loves it! I especially like the fold up end table. The chair is firm and comfortable (not "sink down into") which is better for my bad back. In addition, the pocket system on one arm holds anything I might want with me, and the table on the other holds mugs, plates, etc. The perfect camp chair. I have problems with my legs hurting when I sit in most chairs. We were at a pig roast and the host just purchased the Picnic Time sports chair and I thought they were the greatest thing to sit in for a long period of time. First thing I did when I got home was look online to purchase one of my own. Having wasted my money on a sports chairs that are hard to get out of and break so easy. I saw your chair at a rod run and went online and ordered 2 best Camp chair I ever had comfortable and good looking to. Love them. My Mom had one of these chairs for taking to dog shows. While you can buy portable/folding chairs for cheaper, she needed the back support this chair provided her bad back. The fold up table and the pouches for grooming supplies made this chair perfect for her. The best of all, it folds in half, carries easily, and is extremely lightweight. I liked it so much I bought two for my camper. If you want a cheap folding chair to slouch around in, buy something else. But if you want a quality chair that is lightweight to carry, but supports your back, plus has nifty "extras," this is a great chair. Highly durable. I love these chairs for dog shows. I had a hard time finding it in purple - very pleased. I had previously had a Coleman director's chair and loved it as it was solidly built and comfortable. The new chair has a wonderful side table and storage pockets which makes it even better! These will be used as trophies for our dog show and will be very appreciated by the recipients. Great Product -- wish we'd had these chairs years ago. This chair is the absolute best! I bought then for my husband for his birthday but I get more use out of them than he does. Received this chair very promptly. I have used it several times and although it is heavier than I expected, it is much stronger than I expected. I highly recommend the chair. We love our new chairs. They are lightweight, have a carrying strap to take from place to place, and are easy to open. They are very comfortable to sit in. I love the fold up table and the side pockets for carrying things in. I love this chair. It is very comfortable and sturdy and easy to get out of. The side table is such a nice feature and all the side pockets come in very handy. I love my chair and will order more for husband and friends. Fantastic! Be prepared for more dog people ordering. At a show of over 300 exhibitors, I had many questions about where I got the chair. Be prepared! It is lightweight and easy to carry. Thats what people are looking for. The most comfortable chair ever for outdoor events. Great price, too! I love my sports chair. I go to agility trials most weekends and have to handle food, drinks, papers, leashes, etc. with no table nearby. The side table is great to set a plate on and the pockets hold all the small things you need when you're away from home. It folds up quickly and stores in a very small space in my car and is the most sturdy chair I have ever had. I bought our chairs for my husband and myself for Father's Day. He loves his chair (as do I) because with two knee replacements he can sit and stand because of the stability of the chairs. Also they are very comfortable. We are glad we have them. My husband and I purchased two of these chairs and love them. They are comfortable to sit in, fold up easily, and store a lot of stuff in the side pockets. We also love the tray. I love these chairs. I now have three of them. They are very well constructed, easy to fold and lightweight enough to carry with ease. The attached table as well as all the pockets for "stuff" is an added bonus. An excellent chair for taking places. They are lightweight and the strap helps in carrying it. Side pockets provide lots of storage space at sporting events and the side table is very handy. The first time I used this chair, I got a lot of compliments and interest. Side table was a real hit! Comfortable and practical! This is ther Best chair of this kind I've ever had! It is extremely easy to get out. I will be replacing all the other outdoor chairs I have. I take this chair everywhere with me, and people always comment on it and want to know where I got it. It is lightweight, sturdy, and can take somewhat larger people! It is also attractive. I don't like the fiesta and Riviera colors at all, but find the blue, green and red colors fabulous. Have not seen the purple color yet. I now own 6 of these chairs, keeping 4 in Florida at our winter home, and 2 so far in Pittsford NY at our summer home. The chair is great! I love it and hope to order another soon. I am very pleased with this chair and love the pockets on side. It is ideal for drink, cell phone or papers or whatever. Excellent camp chair. The table is great for books or a cup of tea, the back comes off and can be personalized on both sides. Bottle water keeps cool in the side pockets. These chairs are very popular at dog shows! Good value....solid chair...we like the side pockets..
My Son-in-Law was very excited when I gave this chair to my husband. He said "I want that", so this year for Father's Day, we gave him one - in a different color than my husband's. By the way, my husband is very proud of his and a little jealous that his Son-in-Law also got one. Great item: Useful and comfortable. We use them at the AKC dog shows for our Pomeranian s ringside. We can "sit" and the dogs can "stand" on the pop up table staying perfect before entering the ring! We keep all our grooming items in the pouch on the other side. Had the back of the chairs custom embroidered with the Pom's-Kennel name too. I absolutely love this chair. It is so comfortable and easy to carry. Love it! It's lightweight, portable, stores in a small space, sturdily constructed with add-on features that are well-designed and well-placed. I show dogs and I like the firm straight back of the chair. I also have the table to help me write my notes on and have my drinks. The packets on the side is very useful for my papers and books. I love the chairs. They are so comfortable. These chairs are great !!!!! These chairs were the talk of the camping trip to Pensacola Memorial Day Weekend. Everyone thought that the chair was extremely functional and well made to accommodate very heavy people. I am very pleased with this product and I would purchase more. I find this chair fits and exceeds my needs and I am asked from other people where I purchased it. I would like to order them as gifts also for family and friends. The chair is great. It lives up to my expectations in every way. It's comfortable and looks good. I have received a lot of good comments. This is a great travel chair. We use it for Jazz concerts and the like. Once we had to bring chairs to a friends backyard picnic and our chairs were the talk of the affair. Its comfy, roomy, and you have pockets to put everything and anything. A side tray to hold your plate and beverage and a shoulder strap, plus it's good looking. You couldn't ask for a better chair. I go to baseball every weekend and this chair has been a life saver!! The chairs are great, easy to carry and fold up. And the top back can be taken off fairly easily so they can be customized. These chairs are fast becoming a favorite around the dog obedience shows. Have seen this chair at dog shows for some time. Finally just had to have one of my own. I am so satisfied with it. Easy to carry, has pockets for doggy items and a water bottle for me. Several people have commented on the color. Comfortable and easy to transport. I love the chair, it is perfect. It is an excellent chair and met all of my expectations. The chairs we purchased were perfect for our motorhome use. They fold up nice and small for storage and love their extra features of table and pocket sides. Recommend highly for all RVers. Thank you for shipping to Canada! 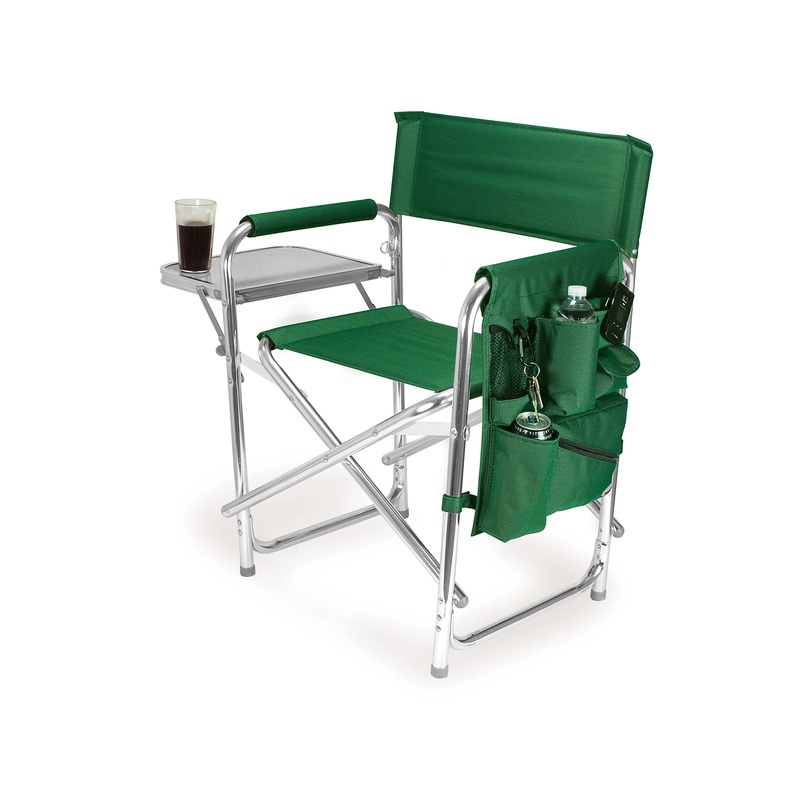 This light-weight, folding chair with the firm, high seat was just what I was looking for. The matching fabric on the arm rests was important to me. I didn't think that I would use the folding table but I have already. Great sturdy and comfortable chairs. Great chair, easy to sit in and easy to get out of. Convienient pockets to store stuff in, and solid, not wobbly. It is harder to carry than the type of chair that folds up into a "tube" but everything else far outweighs that one disadvantage. Excellent product. This is my fourth chair of the exact same design, all from different stores. Service was prompt and the chair arrived in perfect condition. Best price I've gotten for this chair. We primarily picked this chair because it would be easy to get in and out of, and still be comfortable. Lightweight and easy to carry. The table and the pockets are a big plus. the only thing is that i bought it for a lefty. he was a little bothered that the table was on the wrong side for him. he actually asked me to call the company to see if i could purchase it in a lefty. This seems to be a good chair. This is my story. My company purchased about 3000 of these chairs for our company Christmas present this year. I liked mine so well that I ordered two more for my young friends who have a lot of outdoor get to gathers, and never have enough chairs. I was pleased with your service and first time contact (always a concern to me) as well. I think these chairs will serve well. This is a great chair. I use it at work when I have to go on location. The organizer pocket holds phones, radios, equipment needed for my job. The strap makes it easier for me to carry the chair from location to location. And as a bonus, when not at work it makes the perfect chair to plant in front of the TV for playing XBOX. Excellent quality - shipping was much faster than anticipated, expecially just a few days before Christmas. Had chairs backs embroidered at a local tropy company - really made them look extra great ! I love the chair, It's light-weight and easy to carry around at the dog shows. The side table is an excellent feature that I use all the time. This chair is just perfect for my agility trials I attend. The table is perfect for drinks and treats for the dogs. I had seen the chair used by exhibitors in VA and FL and had to have one. Thank you for a wonderful product. The chairs are very sturdy, easy to carry and very comfortable. Great chair - excellent quality! Very nice product and timely shipping. I love the sports chair. It is light weight and easy to carry. It has a firm set so that it is easy to get up from the chair. It is also comfortable. Also, I have an embroidery machine and I have been able to customize the back of my chair with designs of my choosing. This has generated two more orders for your chair because folks wanted me to do a similar chair for them with the customized back. All the folks have been impressed with the lightweight chair and how comfortable it is. We found the chair the absolute ultimate for it's purpose. It's excellent for potlucks so you don't have to juggle food and drink or sit at an uncomfortable table. It's easy to rise out of because the comfortable handles are nice and high. Great for just lounging and it folds compactly. It's light for it's size. We like it so well I want to order another in Hunter Green. My Husband is able to get out of the chair very easy. He likes how the table on the side works, and it is very handy. I love these chairs- Everyone in the dog community uses these chairs for dog related events. They are much more comfortable that the fold-up slouch chairs. This is the third one I have purchased from you and the chairs are shipped in a timely manner and always arrive when promised. It was expensive, but I had a similar model, from CostCo, and I NEEDED another one. The shelf attached to your chair is much nicer than than CostCo's. Also, I've GREATLY enjoyed using the bag on the opposite side (CostCo's model didn't have one) to hold my water, cell phone, etc. I am VERY pleased with the quality and practicality of this item. I have arthritis in my hips and the Picnic Time Sports Chair gives me such wonderful support. I also love all the convenient pouches, not to mention the table attachment. The items were ideal for what they were purchased for. I am looking forward to using them for a long time. Shipment was fast and easy. Thumbs up! Good quality, comfortable chair with nice features. This is a great chair. I am an artist and take this chair with me when I work outdoors. 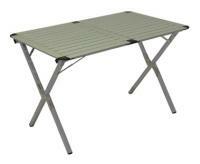 It is lightweight and comfortable and the attached table and pockets are very useful. My husband tried this chair and liked it so much we bought a second one for him. I am very pleased with the chairs. It is exactly what I was looking for. This is an excellent product. Light weight yet sturdy. Great chair, sturdy, easy to clean, finish on frame takes a lot of abuse without scratching. The Sports Chair is a back saver as well as a life saver. The firm seat and straight back gives excellent support to anyone with back problems. The chair is light and easy to carry plus it's down right handy! During swim meets we can eat, drink and stay merry thanks to the table and side pockets. It's SOOO comfortable. My only complaint is that you can't order it in custom color's...I need bright orange! It's a wonderful product. We love the new chair with the table. We have taken it to many concerts in the park by our house. Everyone coments on how nice it is to have a table with your chair. I bought one for my Dad for fathers Day, he also loves his chair. I absolutely love my chair. People comment about how well made the chair is and they love all the "bells and whistles." These chairs are great. We use them at ring side for dog shows. Very light and comfy. I purchased two camping chairs. They have a fold up side table which was just perfect & the main reason for buying them. They also have all the side pockets you would need to have anything extra handy at all times. A wonderful product. Another great feature was they come in Red Canvas. I've only seen green coleman stuff before. Great product and I'm the envy of all my friends. The chairs are exactly what I ordered. They are a great chair. The side table is one of the best features and also durability. Totally fantastic. Side pockets comes off easy. Velcro could be stronger. The chair is fantastic. This is my favorite outside chair. It does not sit you down in a hole, you sit upright and it is expecially easy for us old folks to get out of. It is really great to have the little side table to place your drinks, camera, and snacks when you are at a sporting event. We had one chair but my husband I both liked it so much I had to order the second one. It is very sturdy and well made. I love this chair. It is comfortable and portable. I bought this chair as a gift for my husband. We both love it, and I hope to buy one for myself next year. I've also had many comments from friends, asking where I bought it. Highly recommend it. Very pleased with the chair. It's very sturdy and functional. It's easy to store with the collapsible feature. This is the best chair for traveling and the beach. It is lightweight and has pockets for all my stuff from cell phone to water bottle. I love the tray so i can use it for lunch and a drink or as a writing table at a workshop. I actually bought it to go with me to an outdoor workshop and many people asked where I got it and they had to have one too. Thanks for making the perfect outdoor chair! Just the perfect chair for watching soccer or lacrosse. I looked everywhere for years. This is the one. I love this chair. It's extremely comfortable and sturdy - a good height and width for me. It is also very lightweight and easy to carry. 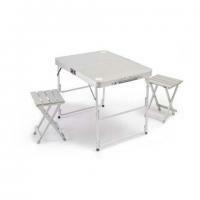 The pockets and fold down table are an added plus. This is the ONLY camp/sports chair you'll ever need! It is tough, comfortable, and travels with ease! You sit up as in a chair- none of that "please help dig me out of this chair" like in other camp chairs. It is strong- I weigh over 225#, and it holds up. This is the second chair that I've bought- the other one is going strong at >2 years. The table comes in very handy, and the pockets on the side are very convenient for bug/sun spray, cell phone, a book. I show dogs and this chair is a hit at every show I go to- everyone wants to know where to get one- and dog show people KNOW camp chairs! Excellent, excellent product. 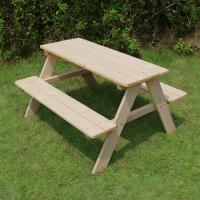 The perfect picnic chair that's not only comfortable, but has its own built-in table! Lightweight and easy to carry, and the pockets are ideal for holding a glass or a bottle of water or wine plus other, smaller items. The only negative--and this is a very SMALL one, not large enough to detract from giving it 5 stars--is that the configuration of the chair does require a fairly level ground surface so as not to tip. That said, the other picnic chairs we have that allow a less level surface are far less comfortable and have no built-in table! The chair is really nice. The extra pockets and table make it very user friendly for sporting events or camping. I love the green color. If anything, it feels a little stiff when you sit it in but maybe will loosen up after using it awhile. We find the chairs to be very good. They are lightweight and easy to carry. However, they are a little hard to collapse. As the strap swivels are made of plastic they are fragile. In fact, on one of our chairs the swivel hooks pulled open and when it was tried to bend them back into shape they broke. Customer assistance is replacing the strap at no cost. That is appreciated. Thank you. This is a great chair! It is not too heavy to haul around. The table works out wonderfully. Just wish the back was a little higher so I could lean my head back. I like this chair! It's sturdy and the side table is handy. So far the chairs are great! We have used them only at the sidelines of 'flag football' games. Both my husband and our son have had both hips replaced due to arthritis. The camping chairs are a perfect height and very comfortable, plus someplace to put things using the shelf and the pockets. Have not used the chairs yet and they were a gift, but we were very pleased with the lightweight and ease of opening, so I think the review could easily go up to 5 after we have a chance to use them. We LOVE IT and use it often! I have actually purchased 3 chairs. The chairs are great. Love the side table, pockets and comfort. We love the chairs. The only potential drawback is that they take up a little more room in our van than the "stuff 'em in a bag" chairs. However, with them being flat, I can put them behind the dogs' crates. I purchased a Picnic Time Sports Chair. It is a comfortable, durable, sturdy, practical chair I use when I go to dog shows. It has a table and some pockets to store items. It is a bit bulky if I have to walk a long distance but once I am at our spot, it is easy to set up and take down and it is very useful. These chairs are very comfortable with the extra padding in the seat and also handy with the side pocket and swing-up table. The only detraction is that the material is a bit more sweaty than the canvas on the chairs they replaced (but we didn't live in such a humid climate when we used the old ones). Since we need to push ourselves up out of chairs, preferably using the arms, this style chair is convenient to take many places. Chairs are great. Lots of people ask about them,and where to get them. The attached table is great. I would rate 5 stars,but they were a little too expensive. Service was also great. I received them really quick. Other than a little difficulty closing the chair for storage we like what we bought - recommended it to our friends.